I love fruit. I really love fruit. It’s not that I don’t like vegetables, but the list of veggies that I don’t like is fairly long. That’s one reason I turn to fruit more heavily, but keeping fresh fruit in the house often requires frequent grocery runs. Plus, one word: smoothies. So when I recently got the chance to try out the FruitGuys, I was excited. They offer a fruit/veggie subscription service where you can receive produce right to your door on a regular basis. I had a choice among fruit, veggies, or a mix. Guess which one I chose? The box of fresh fruit arrived via FedEx. The kids and I opened it up immediately. The fruit was safely packed in a sturdy, sectioned cardboard box, with one of the sections containing a freezable ice pack. It was completely thawed, but I imagine it was frozen when its journey began. The fruit was in great shape. In my all-fruit box, I received organic bartlett, comice, and bosc pears; gala and liberty apples; other unlabeled pears and apples; persimmons; an avocado; and a small bunch of green grapes. I found a new home for the avocado (which was gorgeous and perfectly ripe), but the kids and I dove right into eating the others. Everything was fresh, good looking, and delicious. The pears needed a couple of days to ripen, but it’s more convenient when all of your fruit doesn’t ripen at once. FruitGuys started as a business to deliver fresh produce to people at their office, making sure they had plenty of healthy food to snack on. They then branched out to home, school, and gift services. FruitGuys aims to deliver produce as local to your area as possible, so what you receive will depend on your location. They offer both organic and conventional produce. 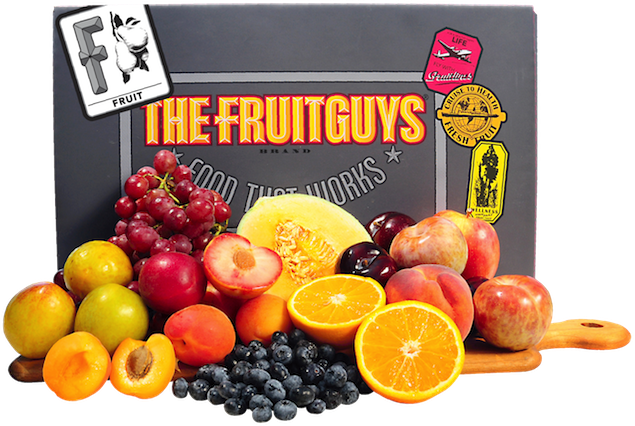 Melissa Wiley has written up a bunch of subscription box services, and the FruitGuys is definitely one to add to the list. Boxes start at $26, and come in small (16 servings), medium (25 servings), and large (50 servings). You can have them sent weekly, biweekly, or every four weeks. I recommend this service to those who like quality, seasonal fruit to just show up at their door. It can be a surprise to see what you get each time, or you can check the website to see what the week’s offerings include. Regardless of what you receive, it’s all quality, delicious produce. Note: I received a lovely box of fruit for review purposes.